It is super cold. I’m walking in the snow, at a vigil for homeless folks who have lost their lives due to their harsh and unforgiving circumstances and living conditions. I’m cold and shivering, because I am walking in ankle-deep snow, and my shoes are getting soaked, caked with ice, making my feet frozen and stiff, as cold winds brush against my face. But I am here tonight to honor those who I love, respect, care for, and admire, for their strength and resilience. I have never gone to a vigil before, but I am already humbled to be here, and the harsh reality of homelessness and homelessness as an unfair death sentence is hitting me very hard tonight. I watch as some of my close friends break down into tears beside me, and it is not long before I start crying myself. It is hard to hear the many names being read as we honor them, many people on the street who have died, and who probably died alone. But they are not forgotten. They are immortalized in our memories. I think about them as I continue to attend the vigil, and indeed, even though I am very sad to hear about these losses, I know that the silver lining is that the people who have died serve to remind those who are left behind of what really matters: that is, caring for others, and being there for others, no matter how hard it is, no matter how hard it becomes. This is one of the blessings of life, and of living. It is one of the great gifts of being human. I cry, because I am aware that I myself could be homeless. This awareness makes me feel vulnerable and sad. Perhaps this awareness that I could be homeless, due to unfortunate circumstances in my life and a certain vulnerability that pervades my being, makes me more sensitive to the tragedy of homelessness, what it feels like to be displaced and alienated, estranged and closer to Death. But this feeling of being vulnerable is nothing compared to what people who are homeless feel: I know this, understand it, appreciate it. Nonetheless, it is very real to me, and it continues to push me to do my best to help those who have been afflicted by homelessness. The mentally ill, a population that is hit hard by homelessness, are too many times seen as hopeless throwaways, the people that society has no use for, as one of my homeless friends points out to me in a moment of deep clarity and brutal honesty: but, I understand that, to me at least, their lives do matter, and I know that there are many people that I work with that care for them. I think it is especially important to keep in mind that those who are homeless who suffer with a mental illness are more vulnerable than others in many ways because their mind is distracted by symptoms, such as crippling depression and racing thoughts, that are very difficult to control: When our mind is plagued by burdensome symptoms, it’s easy to forget you live in a harsh world, making you extra vulnerable to the demands surrounding you. This is all compounded by the fact that they are still simply just trying to survive, and meet their basic needs. 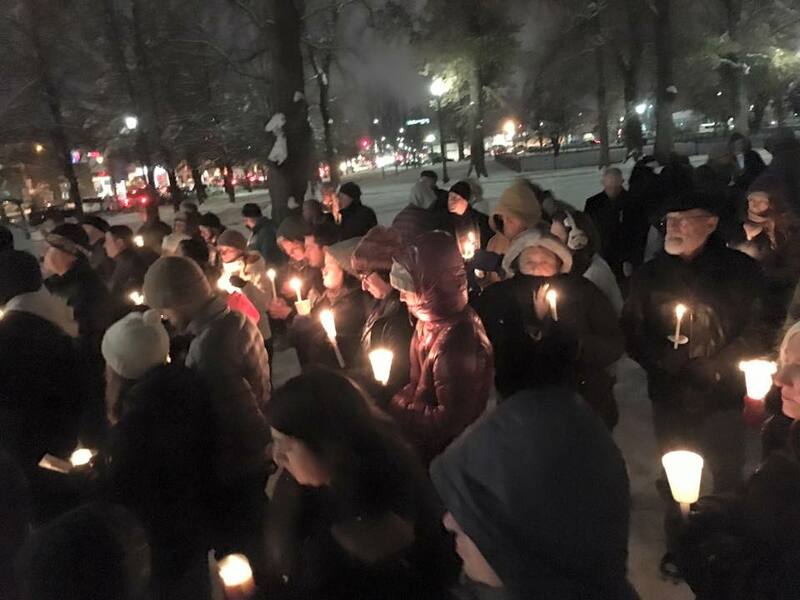 Being at the vigil, and being confronted with the harsh reality of people, just like me and you, who live on the streets, inundates me with emotions, and the feeling of loss is very real. However, even though it is hard to be here, with me freezing in the cold even though I am wearing a sweatshirt and a jacket and jeans and shoes, and even though it is hard to be here because of the reality that I am forced to confront, I know that I need to be here. It is important I be here, and it is my moral duty. I must honor those who have passed. I think about how homelessness affects everybody. The streets don’t care if you are Caucasian or African-American, three years old or fifty years old, addicted to drugs or suffering from a mental illness, a mother or a son: none of that matters, and none of that keeps you any safer. Homelessness is truly a manifestation of one of the harshest lives a person could ever live, and it shows no mercy, knows no boundaries. I listen to a story about a homeless woman who overcame her substance abuse to gain back the trust and love of her children, to find sobriety, and most importantly, to find hope again. I listen to the story and feel empowered, and feel deeply touched, knowing that some people are fortunate enough to find the support that they need. However, I am also reminded that not everybody is as fortunate, and not everybody has the opportunity to get off the streets and chase their dreams. Homelessness is lethal. Homelessness has the capability to be your death sentence. Being on the streets shortens your life span, strips away your hope, tears you away from your loved ones, fills your brain with cortisol, overstresses your body, and at the end of the day, makes you feel abandoned and alone. As I continue to attend this vigil, I can’t help but think, if only more people cared, if only more people knew of the plight of our homeless friends, if only there was more awareness and less stigma and misunderstanding, less hatred. But homelessness does not have to be a death sentence, as if we were more compassionate and loving, and embraced our brothers and sisters, well … there is no telling what kind of good could be accomplished. It is nights like this, nights where I am moved to tears because I understand very important and fundamental principles of this harsh reality that we live in, that I know that I need to do better, that I know that I need to try harder, and that I cannot give up on my dreams to help out the homeless population in whatever way I can. My love for them is real, and I don’t say that lightly. I truly mean it, and it truly touches me to see the compassion and grieving of my fellow friends. It is a gift to be here, it is a blessing, truly. Death will never understand that he doesn’t control our destiny, that we don’t ever truly die, that we live forever. What does Death have to be proud of? I understand: Nothing. He can’t tear apart our hope and the way in which our souls unite. I struggle to sort through all of my troubling and complicated emotions, freezing in the cold, and unable to imagine what it is like for a homeless person to live in this kind of weather day after day, abandoned and alone, searching for food in dumpsters, or begging for a couple dollars to buy something from a fast food restaurant. I know I will struggle with these emotions for a long time; these kinds of feelings don’t just easily leave, this kind of penetrating insight and understanding and experience doesn’t just disappear. It stays with you. It stays with you forever. You remember, and you would do well to never forget. And so, I cry. 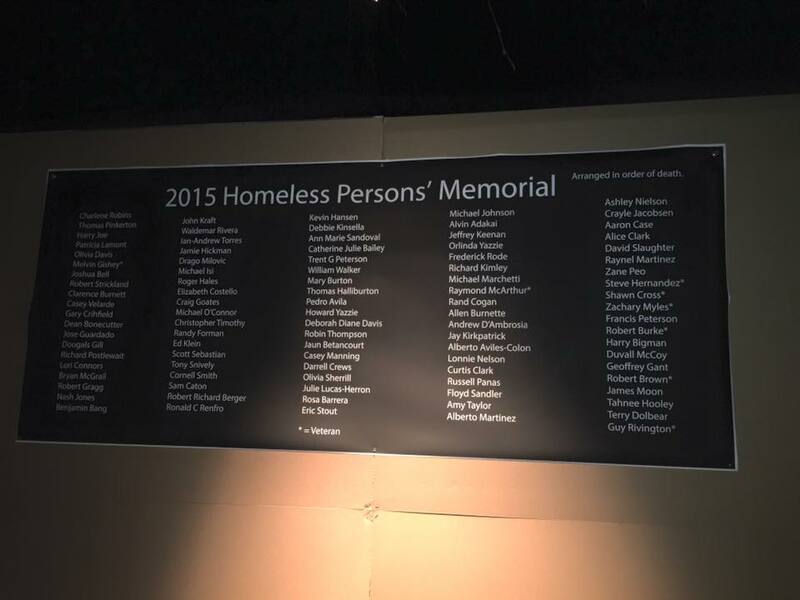 I cry when I am reminded that even though we have lost too many beautiful lives from homelessness, there are still people on the streets, trying to survive in this harsh world. I cry because I know I could be just like them, alone and homeless and mentally lost. And I think about how hard I have tried to help the homeless, and how I have known for as long as I have tried to help them, that they deserve and need the help, and that we cannot forget about them. I think of all of the time that was lost, when I was never given the opportunity to help the homeless, when I was in fact denied the opportunity time and time again to help this beautiful population, and that hurts me deeply, because I always knew deep down that this population needed me, and even though I was only one person, I could make a difference. Nonetheless, the tears solidify into conviction, the sadness becomes a gentle fire in this cold winter of deprivation, and I am aware that I will continue to push forward, and will continue to be the best person I can be to help out those who are in need. I am not giving up on them: I can’t give up on them. But I also believe that they have not given up on me, either, and that means the world to me. I look to the future with hope and conviction: Death, be not proud.